The Mercer Culinary Genesis 7 inch Knife is my favourite knife and I would highly recommend it to anyone. Recently I was on the lookout for a new knife to add to my cutlery collection, initially what persuaded me to go for this knife is the lifetime guarantee. Once I put the knife into practice, I became aware of all the other great features of this knife, the handle is superb and the blades are precise in cutting. What more could you ask for! Thanks to a combination of modern technology and finely crafted German steel, the 7 inch knife has one of the best handles in the forged cutlery market. The black nonslip Santoprene handle provides a comfortable yet secure grip for the knife. The grip on any knife is extremely important, the user always needs to be in control for practical uses, as well as obvious safety measures. As mentioned the handles provide substantial comfort, as well as a non-slip grip. 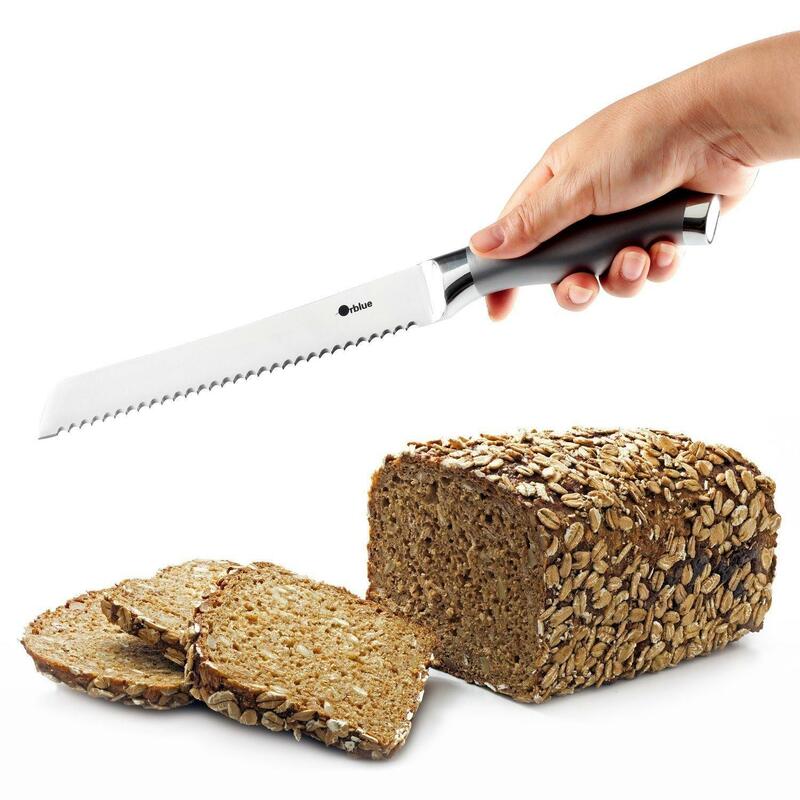 You won’t have to worry about wet hands, even then you can still have a firm hold of the knife. Hot or cold water? Not a problem for this handle, it can really take it all. Overall, this handle is strong and durable. When this knife was in development, Mercer Culinary took care with this process. They want to create a unique, strong knife and that’s what they have done. The strength and durability of this knife can be attributed to the precision forged construction. What’s more, a full tang runs the whole length of the handle, to provide even better balance. No one likes a flimsy knife that slips and slides of your hand, this is a real knife, with a real handle. Let’s talk facts. 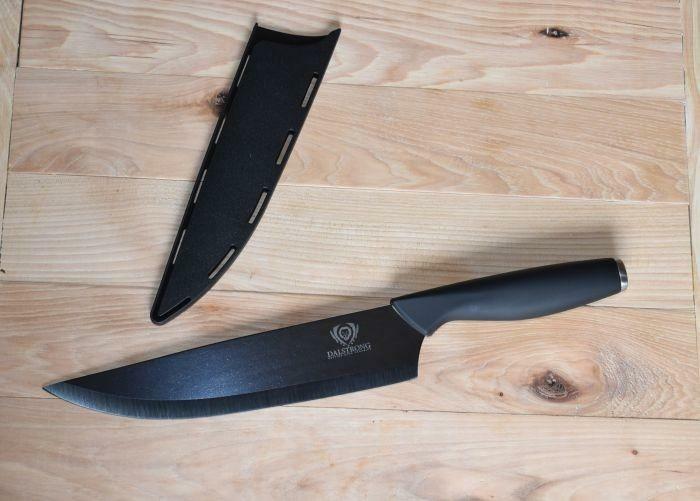 This knife slices with extreme power and minces with the utmost precision, for almost any cook this is one of the best knives you can get. 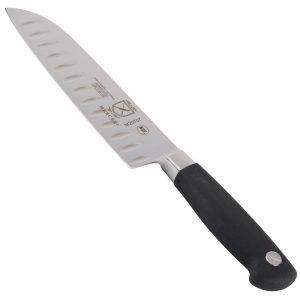 You can cut with confidence using this knife, the weight of it feels comfortable in your hand. Strain and pain are problems of the past with this product! The taper ground edge that is the bottom of the blade provides added stability to the knife. This edge allows for easy honing and ensures a long lasting sharpness, this is great news for us cooks as it increases the efficiency of the knife when we are cutting and chopping our food. Injuries are a real possibility with any knife, such as strain through repetitive use. You will be glad to hear this knife has been designed avoid these potential stresses and keep your hand pain free. In its lifetime this knife has amounted to just under 600 reviews from customers, what is special about these reviews is that the average rating is 4.8 out of stars, a really incredible score. More than 95% of customers are very happy with this product, if that isn’t assurance then I don’t know what is! 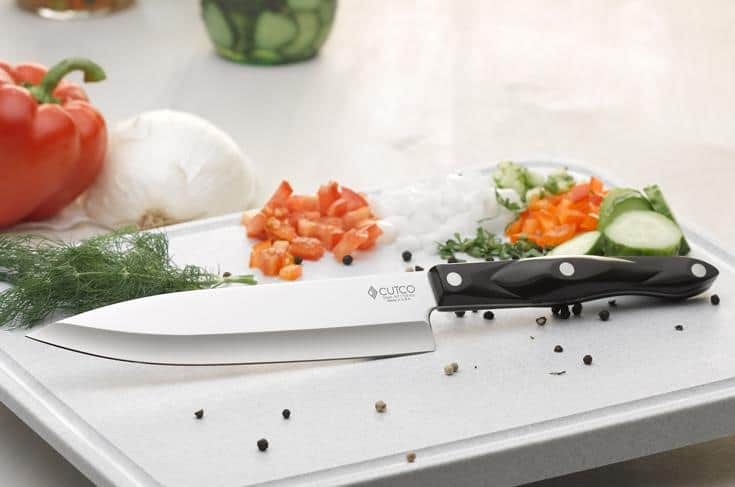 If you are after a reliable knife to take care of your food preparation duties, then you must seriously consider this particular Mercer Culinary product. The impressive knife offers a range of features and benefits, namely its superior handle and unique German steel blade material. Be sure to check this one out.